Dean Lawrence Freeman, 70, of Wamego, passed away Tuesday, January 29, 2019. He was born in November of 1948, in Akron, Ohio, the son of Glen Lawrence and Thelma (Stair) Freeman. He was a 1968 graduate of Cuyahoga Falls High School, Cuyahoga, OH. 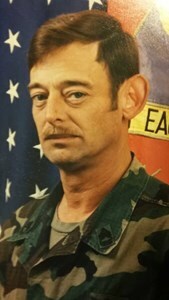 He entered the United States Army in 1975 and served until his retirement in 1996. After retiring from the Army, he worked for Ebert Construction in Wamego, retiring after 20 years of service. He was a member of Pearce-Keller Post No. 17 American Legion, Manhattan, KS and the Disable American Veterans. Dean married Donna C. Clouser on May 4, 1979 in Clarksville, TN. She survives of the home. Other survivors include a daughter, Kelly Freeman, Wamego; and several nieces and nephews. He was preceded in death by his parents; two sisters, Jody Conn and Sue Schneider; and two brothers, Gary and Ronnie Freeman. Dean was a very active person who enjoyed the outdoors, especially fishing, NASCAR, and working on cars. Honoring Dean’s request, cremation is planned. No services are planned. Dove Cremations and Funerals, Southwest Chapel is assisting the family. In lieu of flowers, memorial contributions may be made to Wounded Warrior Project, P.O. Box 758517, Topeka, KS 66675-8517 or to American Heart Association, 5375 SW. 7th St, Topeka, KS 66606. To leave a special message for Dean’s family, please click the Share Memories button above. Add your memories to the guest book of Dean Freeman.